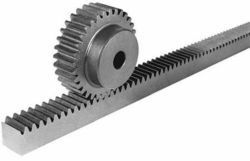 Pioneers in the industry, we offer racks and pinion from India. We are Manufacturer and exporter of a comprehensive range of Industrial Gears and Rack Gears, which are used by various industries. These products have superior quality and are available at prices leading to the industries.